As a quality-oriented organization, we are focused to provide our clients excellent quality Insulated Set. The offered set is manufactured using premium quality components and ultra-modern technology at vendors’ end in line with industry norms. Our provided set is availed in varied designs and specifications. Moreover, this set is tested by our quality examiners on various parameters so as to ensure its quality. We have gained recognition as an eminent enterprise, devotedly engaged in offering a broad range of Injection Insulated Open End Wrench. Backed by our skilled professionals, this open end wrench is procured from the certified vendors’ of the market in sync with industry norms. 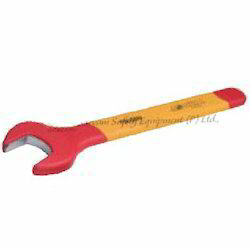 Used to provide grip and mechanical advantage in applying torque to turn objects, this open end wrench is availed in different designs and specifications as per the demands of our valuable clients. Our quality examiners test this open end wrench against different parameters so as to ensure its quality. 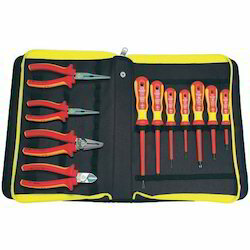 Looking for Insulated Tools ?